Ambassador Ivita Burmistre took up her duties as Permanent Representative of Latvia to the OECD on 2 August 2016. Ms. Burmistre holds a Master’s degree in Economics from the University of Latvia. In 2013, Ms. Burmistre received merit awards from the Cabinet of Ministers and the Ministry of Foreign Affairs, and, in 2015, the Prime Minister’s letter of commendation. Ms. Burmistre joined the Ministry of Foreign Affairs in 1999 and throughout her career has held a number of high-ranking positions: from 2002 to 2005, Ms. Burmistre was posted at the Embassy of Latvia to the United States; from 2005 to 2007, she led the Division for International Trade and Investment at the Ministry; from 2007 to 2011, Ms. Burmistre was Deputy Permanent Representative to the World Trade Organisation (WTO) in Geneva; and from 2011 to 2015, she served as Director of the Department for Economic Relations and Development Co-operation. In December 2013, Ms. Burmistre was appointed Deputy Head of the Working Group for Negotiations on Latvia’s Accession to the OECD and in February 2014, key high level contact person entrusted with coordinating national authorities involved in the accession process of Latvia to the OECD. 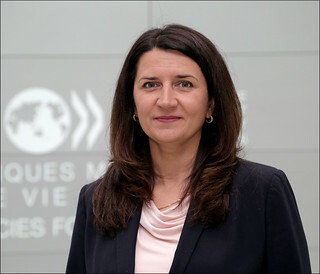 From February 2015 until her appointment as Permanent Representative of Latvia to the OECD, Ms. Burmistre served as Director of the Economic Relations, Trade, and Development Co-operation Directorate at the Ministry of Foreign Affairs. Ambassador Burmistre is married and has two children.